There are a lot of questions circulating about the new BC curriculum and what it means for our Montessori programs in Vancouver. This entry was posted in Uncategorized on October 10, 2016 by kxmorrison. But first… I want to talk straight about Money. why we ask for money at all? why we ask Montessori parents for more money than traditional parents? what we do with all that money? This entry was posted in Uncategorized on September 26, 2016 by kxmorrison. One of our amazing teachers forwarded me this invitation to post. It’s an opportunity to join a free online parenting event over the next 21 days. Unfortunately, children don’t come with instruction manuals… but there are people out there who devote their lives to discovering better parenting techniques and practices based on scientific research and knowledge of child development. This entry was posted in Uncategorized on September 21, 2016 by kxmorrison. Welcome back – or if you’re new to Maple Grove – Welcome! There will be attempts at scintillating content in the weeks and months to come but today I just wanted to say hello and draw your attention to the next PAC meeting. This entry was posted in Uncategorized on September 6, 2016 by kxmorrison. 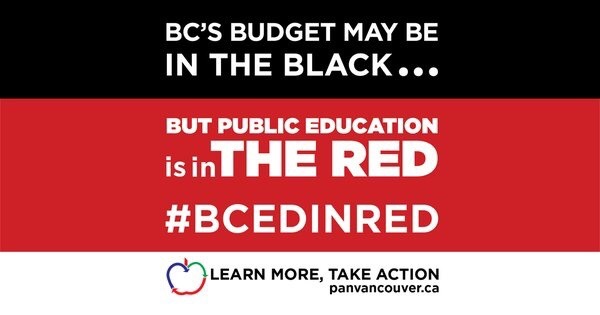 On Thursday, May 19, we encourage all citizens across BC to join us in wearing RED to mark the fact that, although the BC budget is in the black, public education is in the red. Thursday, May 19, marks the end of the current Legislative session and the passing of the BC Liberal government’s balanced budget. Sadly, while BC may be in the black, public education is surely in the red. As part of a joint FACE-PAN campaign — #bcedinred — FACE has been tracking school district budget shortfalls. As of Wednesday, May 18, half of the 60 School Boards had reported operating budget shortfalls with a combined total of $84.17 million. The BC public education system has seen a long history of adverse policies and chronic structural underfunding which has crippled the public system forcing school boards to cut programming, support staff, resource workers, counselors, specialist teachers, librarians, maintenance, resources and supplies while increasing class sizes and closing schools. The 2016/17 BC budget indicates that we live in a province of relative prosperity. Unfortunately, public education is not being funded accordingly, much to the detriment of our future society. PAN and FACE believe that a high-quality public education system is the cornerstone of a democratic society. We cannot condone a budget that is balanced on the backs of children in public schools. On Thursday, May 19, we encourage all citizens across BC to join us in wearing RED to mark the fact that, although the BC budget is in the black, public education is in the red. This entry was posted in Advocacy, Uncategorized on May 18, 2016 by kxmorrison. We interrupt the usual content on his blog to encourage you to advocate. Now. Today. The VSB proposed budget is out and they have had to make impossible decisions to balance the budget in the wake of chronic and long term underfunding by the BC government. Larger class sizes? Check! Fewer resources to support special needs kids? Check! Closing schools? Check! Are the special programs like Montessori, Arts, and French cut? Not yet – but if the proposed cuts are made and nothing changes what will be left to cut next time around? There will be opportunities for public input on the budget but those sessions won’t magically fund the school board. What can you do? Care! Advocate. Write your MLA. NOW. It’s so easy – here’s a tool that basically does it for you. Will it work? Who knows but don’t we need to try? This entry was posted in Uncategorized on April 4, 2016 by kxmorrison. This entry was posted in Uncategorized on December 7, 2015 by kxmorrison.